Are Koya A Good Brand Of Wheel? Hey guys, Ive got a kit id like to install on my 33. I have a genuine GTR spoiler and Skirts, with a GTR rep front bar but with genuine Gtr front indicators. The skirts and spoiler are easy enough to install, but because ive got genuine parts, Im going to need someone who is familiar enough with these to preferably wire up the middle brake light for the spoiler, and correctly wire up the front indicators to my S2 Gtst indicator connectors. So ideally for the sake of ease id like one place who would be able to not only fit all the items but wire them up correctly as well. Does anyone have any recommendations in Melbourne? Preferably western suburbs/Geelong area.. Or if anyone is super familiar with this stuff, id be more than happy to shout a couple of slabs/bottles/whatever your poison is for the time. Or if its super simple a few pointers to get the job done Thanks guys! How much for the coilpacks? 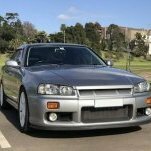 WTB: Sell me your skyline! I'm buying a R32 GTS-T to use as a every day driver. I could sell you my 1990 R32 GTR with 125,000 km on it. Registered running 17psi, motor is capable of running 30psi, built and tuned 25.000 km ago. Look at my post. I will not be selling it for my last asking price.